If the valve motor is driven directly by the controller output relays, the controller outputs are limited to half the voltage of their nominal rating. This restriction does not apply if the motor is driven via external contactors/relays, but those contactors/relays must themselves be rated at twice the voltage that is being switched. Valve motors effectively form an auto-transformer with the OPEN and CLOSE windings having a common neutral point (centre tap). When either winding is operated, the live and neutral connections are made between the one end of the "transformer" and the centre connection. This causes an equal potential to be developed between the centre connection and the other end of the transformer. The effect of this is a potential of twice the supply voltage across the OPEN and CLOSE connections. If 240V AC were to be applied to the OPEN connector of the valve, via one of the controller relays. The relay used to CLOSE the valve (which is not energised at this time) would have a potential of 480V AC present between the common and N/O contacts. This exceeds the relays maximum voltage, and may also cause damage to any contact protection components, such as voltage dependant resistors (VDR). A further problem with contacts protected by VDR's is that when the potential applied across them rises above the nominal rating, their normally high impedance rapidly reduces. This provides a path for current to flow, which could cause the PCB tracks to burn out. The diagram below show how 480V AC would be present across the contacts of the "Close" relay if the controller was used to switch 240V AC. This limitation applies to controllers from all manufacturers (unless their output rating is at 480V). 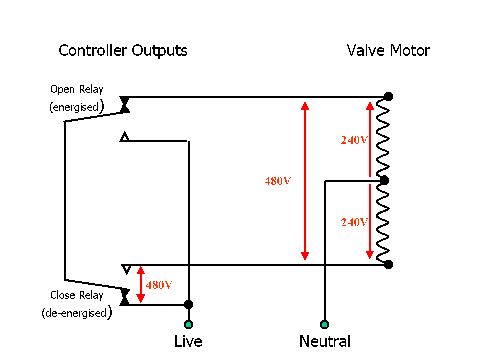 Most VMD's operate at voltages between 24V and 120V. Valve motor drives (whether direct switched or via contactors) should use interlocked connections to prevent power being applied simultaneously to both open and close windings under fault conditions.